No dining room is complete without a nice set of dining room chairs, perhaps the most import chair in the house. We specialize in classic modern dining room chairs and offer a nicely curated selection of dining chairs in a wide range of finishes and colors to match your existing dining room furniture. 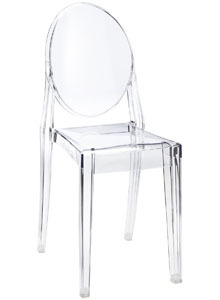 Browse modern dining chair styles from mid-century modern design classics like Wegner's CH24 Wisbhone Chair to contemporary designs such as Kartell's Masters Chair. d.